It's hard to go anywhere these days and not take notice that at least half the people around you are peering down towards their smartphone or tablet. Eyes are drawn down, neck bent at an uncomfortable looking 40 degree angle and shoulders rounded, while assuming the perfect position for gazing into the screen. The new epidemic affecting people of all ages across the US and other countries is what experts refer to as, "text neck." To put is quite simply, "text neck" is pain in the neck and spine due to the loss of curvature in your spine in the cervical region. This loss is a direct result from large amounts of time looking down at your smartphone or tablet. For many workers across the country, a typical day at the office means long hours spent sitting at a desk. When you have free time you are also most likely messaging on your phone, checking out the newest free games and spending time on social media. All of these seemingly harmless activities could make you a prime candidate for "text neck" or similar injuries. This loss in curvature of the spine used to present in much older patients, but it is concerning to see this occurring in such a large population at such a young age. IDC, a tech research firm found that 79 percent of 18 to 44-year olds keep their smartphones with them an average of 22 hours per day. 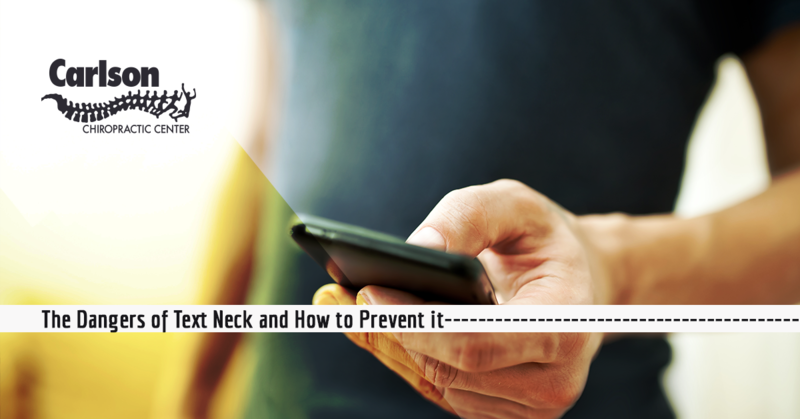 Can "Text Neck" Be Prevented? Take into consideration your current ergonomic setup at work and make a few adjustments that your body will thank you for. With something as simple as moving your laptop or mobile phone up to eye level and taking short breaks away from screens during the day, you can limit the amount of strain you're putting on your neck. You can help prevent this critical loss of the curvature of your spine by simply straightening your back and not "looking over" the phone from a hunched over position. Bringing your phone up to eye level will also substantially help keep your spine in the right position. Click here to see a quick demonstration of better posture that will help you maintain this curvature in your cervical spine while using your smartphone. The pain and discomfort associated with "text neck" can affect people of all different age groups. If your neck, back and shoulder pain is not subsiding after making ergonomic adjustments to your workspace and limiting the amount of time you spend on your phone, it may be time to seek professional help. Schedule an appointment with us to come up with a comprehensive treatment plan. Many "text neck" treatment plans may include manual adjustments, massage therapy and other treatment options to get the relief you need.